SNP Candidate Eilidh Whiteford meets with pensioners at the Albert Hotel in Peterhead. Banff and Buchan SNP candidate Eilidh Whiteford has met with pensioners today concerned over Tory plans to ditch the Triple Lock and cut social care. The politician was joined at the Albert Hotel in Peterhead by older people left in uncertainty by Conservative plans for an all-out attack on pensioners’ incomes, changes to winter fuel allowance and the 'dementia tax'. Earlier this month, Tory candidate David Duguid claimed in a radio broadcast with his fellow candidates, that changes to the winter fuel allowance would still protect those in who in need. But Ms Whiteford warned him many would still face the brunt of the cuts planned under the Tories. 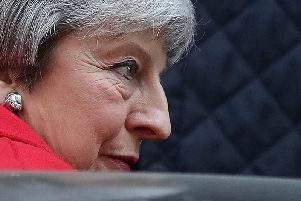 “The Tories have already confirmed they are set to ditch the Triple Lock on the state pension – the guarantee that pensions will keep pace with earnings and prices. “With inflation now rising steeply, the value of the pension will fall in real terms without the Triple Lock. “The SNP will also protect pensioners in Scotland from the Tories’ ‘dementia tax’. Thanks to the Scottish Parliament, care at home is provided to those who need it regardless of their income or assets, unlike in England where it is already means-tested. “Pensioners in Banff and Buchan pay some of the highest winter fuel costs in the UK, and any attempt to cut winter fuel payments to all but the very poorest will hit many pensioners on modest incomes who spend a huge proportion of their money heating their homes. “Theresa May and Ruth Davidson have failed to confirm that the Winter Fuel Payment budget will not be cut before it’s devolved to Scotland. Just as they cut funding for employability services before they were devolved, they are lining up another cut-and-run approach when they devolve the Winter Fuel Payment. “Tories elected in Scotland will simply rubberstamp whatever cuts the Tories plan for our budget. “Now more than ever, it is vital to elect strong SNP voices standing up for Scotland and opposing Tory cuts to older people’s incomes and services," she added.